B480 (51312, 59479 & 51327) passes Quedgeley on 6 May 1988 with the 2B09 06:36 Swindon to Worcester Shrub Hill service. 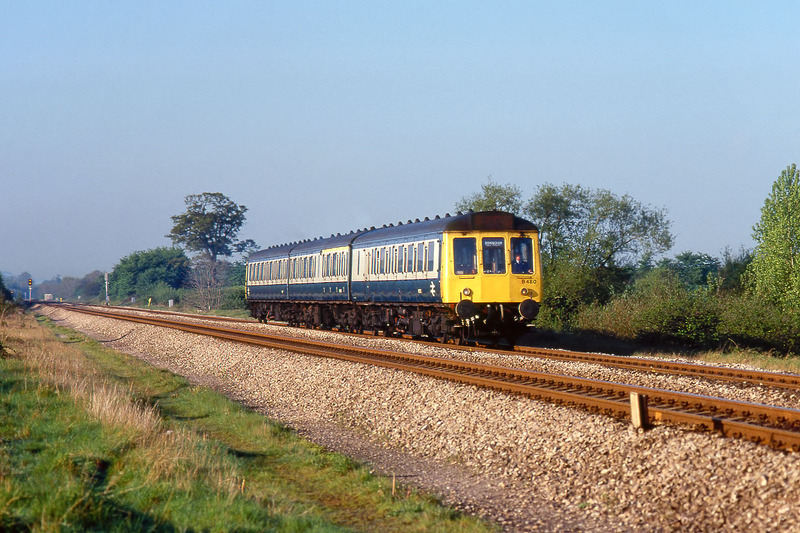 The highest numbered of the Western Region's 15 Class 118 sets (B460 - B473 & B480), B480 entered service in June 1960, and would not quite make 30 years in service, being withdrawn in October 1989, although it had been reduced to a two car unit for its last tear in traffic. It had also spent a lot of time in the early 1980s operating without its centre car. Note the over optimistic Birmingham destination blind!